Information For Starting A Girls Mentoring Program or Girls Club | Afro Puffs and Ponytails, Inc.
Afro Puffs and Ponytails has a new message board geared towards supporting programs for girls. We receive many questions about starting a girls program, and having a free message board is a smart way to answer those questions that will remain on the board and serve as a resource for others with the same frequently asked questions (FAQ). It will also serve as a great space for information exchange for those individuals who are interested in starting a girls mentoring group/program or non profit organization for girls. For more information about our message board, please visit www.plwg.org. 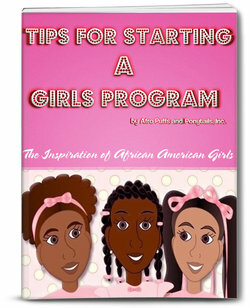 We are updating our booklet, “Tips for Starting a Girls Program”, so continue checking with us. I have been thinking about starting a program in my community for young girls ages 5-12 because there’s nothing and I want to encourage and inspire all girls to become their best. Any advice from the beginning would greatly be appreciated. I need the book! !